Every May, the Administration on Aging, part of the Administration for Community Living, leads our nation’s observance of Older American’s Month. The 2018 theme, Engage at Every Age, emphasizes that we are never too old (or too young) to take part in activities that can enrich your physical, mental and emotional well-being and celebrates the many ways older adults make a difference in our communities. Participating in activities that promote mental and physical wellness, offering our wisdom and experience to the next generation, seeking the mentorship of someone with more life experience than us – those are just a few examples of what being engaged can mean. No matter where we are in our life, there is no better time than now to join in and Engage at Every Age in our local, our chapter and our community. APWU retirees are still Fighting Today for a Better Tomorrow. This year, retirees can sign-up and join Contract Action Teams (CATs) in our APWU locals or states. CATs are the principal method of informing and mobilizing members and winning community support for our struggle to secure better postal services and good jobs. There are many opportunities – and much need – for retiree members to get involved. 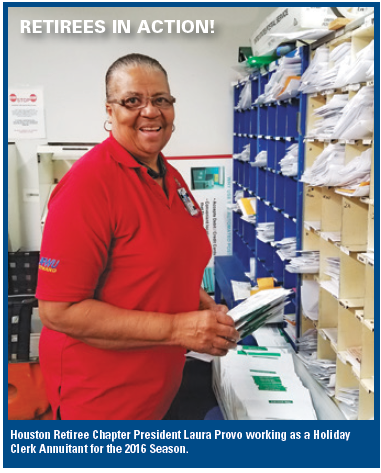 As part of your state or local CAT, you will educate, motivate, mentor and organize members and the community by conducting outreach to potential allies beyond the Postal Service. You’ll explain why their support is needed, organize and share information through various methods on upcoming activities to publicize the issues, and develop new ideas for building support for APWU goals. Another way you can Engage at Every Age is to make sure you are registered to vote and your chapter members, family, friends and neighbors are registered voters. Then we must educate ourselves and others on crucial legislative issues, and when necessary, persuade allies to vote for representatives who support issues of importance for retirees, as well as working families.